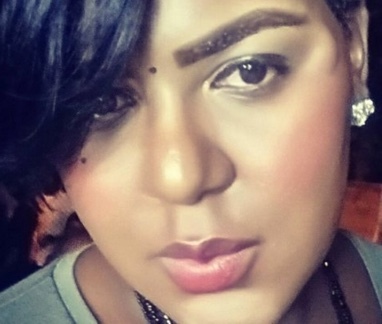 Fundraiser for Jamie Roberts by James Brian Yancey : Support our ATL transgender orgs! Support our ATL transgender orgs! It’s time for the LGBTQIA community to rise up and unite in support of our transgender community members. The recent message from the President on Twitter that transgender citizens won’t have the right to serve in the military is not the best interest of our country. Our transgender friends are not a burden! The Joint Chiefs Chairman has said that he won't make any changes until officially given notice and many claim they were blindsided by this. 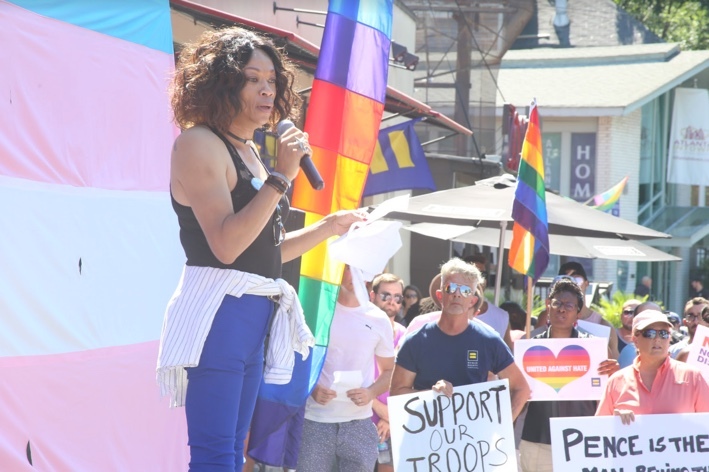 Our transgender friends are under attack on a number of fronts and we are coming together to support causes and organizations that are working to protect and defend them. This event is to hear from, show support of and celebrate the amazing individuals in our Atlanta trans community. We'll take action by raising money for local organizations. Everything is transparent for you to see on this page. Once we achieve our goal we will distribute the money across these organizations and publish the total that each received. 100% of the funds will go to them (minus the fees that Go Fund Me takes out). 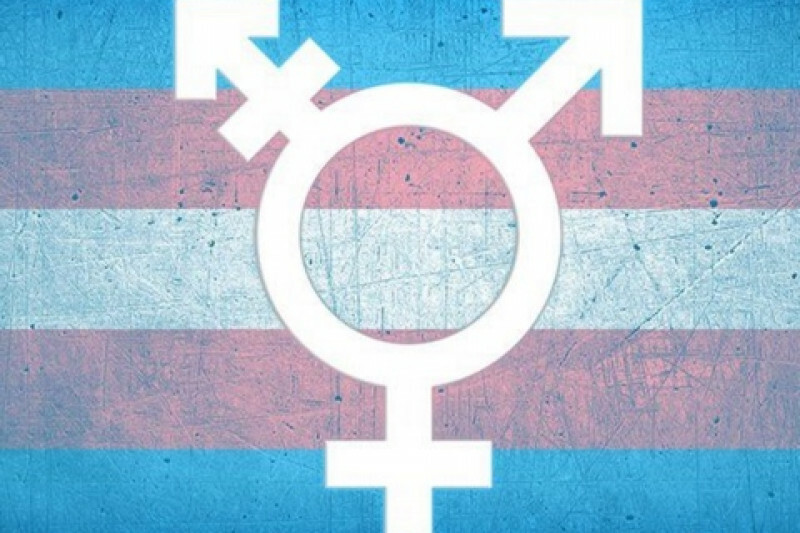 and Transgender Individuals Living Their Truths ( http://tiltt.org/) that fight for trans equality and support the needs of people within the community. It's time that Atlanta knows about them and supports their work. Please join us is supporting their efforts with all donations large or small. Be generous and give as you can. Everyone's help is appreciated and we will show how wonderful Atlanta is in supporting them during these tough times. Hello friends! Good news. In the spirit of honoring your kindness and generosity as part of this fundraise, we are crediting all funds raised to apply to the wall art project we are managing! Each heart on the wall with your name and message is a $100+ donation. What this means for you is that if you already donated $100 or more, then for no additional money, you can have your name and personal message as part of the wall. If you can donate more and want to, then of course we welcome that. If you donated any amount under $100, then we will credit that amount to donating to get a heart. For example, if you donated $25 here and you want to be part of the wall art, then for only $75 you can get a heart. If you already donated $100 or more and want to claim your heart then simply email toobusytohate@gmail.com and tell us your name, how much donated here and what you would like your message to be by end of day THIS TUESDAY. We will include you. If you donated less than $100 as part of the Go Fund Me page and want your initial donation credited, then go to http://thoughtfulness.org/cause/too-busy-to-hate/, make a new donation so that collectively your donations are $100+ and email us at toobusytohate@gmail.com by end of day THIS TUESDAY with your name, how much you donated here and how much more you donated to http://thoughtfulness.org/cause/too-busy-to-hate/. And we will include your message as well. Hopefully this is good news! 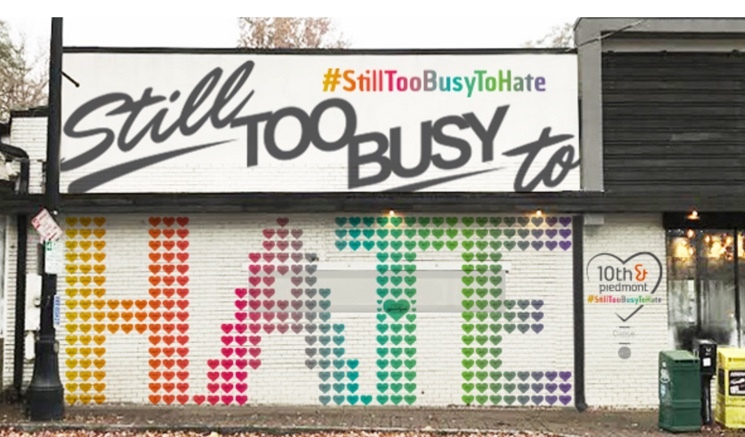 Please help us to promote the wall art project in general as those funds go to charities list on that page as well, with the Trans Housing Atlanta Program being a recipient. Art wall project at 10th and Piedmont! Happy Sunday. Watch our session this morning called Tea with Tracee. Please watch, comment and share to help us drive awareness for this campaign. Our goal is to have 300 shares of the fundraiser by the end of the weekend so if you haven't shared this yet, then please do. We are at $5,085 with $1,300 in direct donations plus what you see here. Our next goal is to get to $10K by August 18th. Help us get there. We are on track so far. Thanks for all you do and thank you Tracee! We are up to 250 shares and our goal is 300 by the end of the week so please do so if you haven't already. Please invite people and ask them to donate and share this to support the fundraising campaign. We already exceeded 25% of the raise. Let's keep the momentum going! Thanks for all you inspiration and support! If you didn't catch the very sad news yesterday, the 17th transgender person was murdered this year alone in the US and saddest of all, it was right here in Atlanta. TeeTee Dangerfield rest in peace. We will keep the efforts going to support your community. Thanks for all you do to help us raise awareness!